The automatic tube pump Drager X-act 5000 is the first all-in-one solution designed for measurements with Drager short-term tubes and for sampling tubes and systems. Ease of operation and a high degree of reliability compliment the measurement and sampling of gases, vapors and aerosols. The Drager X-act 5000 introduces a new era of gas measurement: Only one device is necessary for measuring and sampling. The automatic tube pump is compatible with Drager short-term tubes as well as sampling tubes and systems. The robust housing supports the use of the pump to perform the daily measuring tasks under tough conditions. The components of the pump are corrosion resistant and the pump is additionally equipped with an user replaceable filter which traps sulfur trioxide aerosols protecting the pump for up to two years. The display is backlit to enable use of the pump under poor lighting conditions. All Drager short-term tubes and accessories can be used with the Drager X-act 5000. 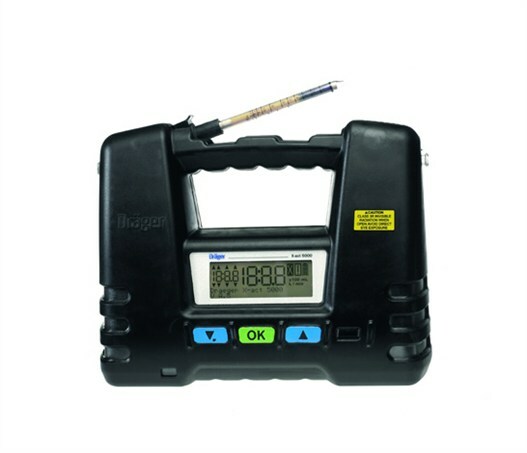 The IS approved Drager X-act 5000 can be used for confined space applications and in explosive gas atmospheres - always ready wherever fast and reliable on-site measure ments are required. NEW PUMP CONCEPT - The Drager X-act 5000 is based on a completely new pump concept. The key principle is the ability to provide the required flow characteristics of the Drager short-term tubes, while also providing the option to be used with sampling tubes and systems requiring constant flow. Compared to the Drager accuro hand pump, this new concept reduces the average measurement time of the Drager short-term tubes in case of a high number of strokes. The internal pump is also designed to use extension hoses up to a length of 30 meters (98 ft.). SIMPLICITY OF OPERATION - The handling of gases, vapors and aerosols has never been easier. The automatic tube pump, Drager X-act 5000, directs the air to be measured through the appropriate Drager-Tubes effortlessly. It is comfortably carried with one hand or using the shoulder strap and is easily operated, even wearing protective gloves. A simple and intuitive menu structure provides the user efficient operation with just a few button presses. Using the password-protected menu repetitive operating modes can be set. AUTOMATIC TRANSFER OF MEASUREMENT PARAMETERS - A barcode printed on the label on the backside of a Drager short-term tube box contains all relevant measurement parameters. Simply sliding the barcode over the barcode reader of the pump, automatically transfers the name of the substance to be measured, the number of strokes, and the measuring range to the display. The required steps to carry out the measurement are simplified with the Drager X-act 5000 and the possibility of making an error is reduced to a minimum. MEASUREMENT IN TECHNICAL GASES - Drager short-term tubes are calibrated for measurements in ambient air. To evaluate measurements in technical gases, the properties of the technical gas must be taken into consideration. Technical gases have a different viscosity than ambient air. Therefore, the flow of the pump must be set accordingly. Following the operating steps in the mode "Measurement in Technical Gases", the Drager X-act 5000 will automatically be adjusted to the required flow parameter and the measurement result can be read directly. DIRECT SETTINGS FOR SAMPLING - Depending on the sampling tubes or systems, the required parameters for the test can be set directly, without the need for an external flowmeter. The Drager X-act 5000 automatically adjusts the flowrate. After setting the sampling time the pump can immediately be started. At the end of the measurement the pump will stop automatically. The set data, the elapsed time and the pumped volume will be indicated on the display.